Feels like a puff of clouds, enveloped with covers, melting into warmth and softness. A natural fit to your body, giving you optimal support and minimal motion transfer, contributing to uninterrupted sleep. 3 Zones spinal protecting system is integrated with firm border design. Excellent resilience and tensile properties. Low permanent set, high elasticity and highest recovery to original shape and excellent tear resistance. Memory Foam is an open-celled, body heat & body weight sensitive material that helps to alleviate the pressure points. Comprehensive protection with antibacterial and antifungal treatment which inhibit the growth of mould & mildew. Necessary to keep sanitary-sensitive areas free and clear of foreign subtstances besides help improve air quality. Fabric cover is treated with anti-dust mite treatment. 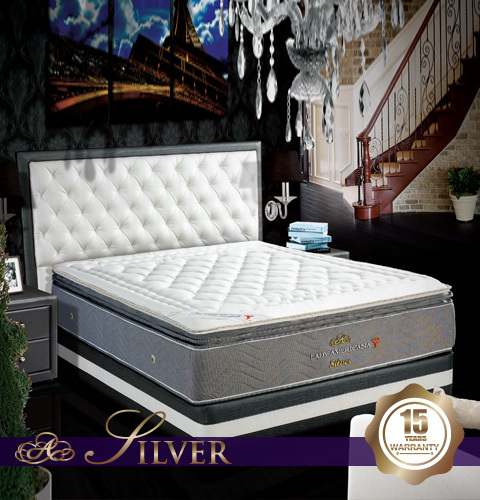 The SILVER provides an increased range of comfort and motion seperation for an undisturbed night's sleep. The advanced technology of the SILVER mattress delivers the nest level of performance, responding uniquely to your body type. Also, there is a layer of FRESHEASE Euro Latex, a naturally anti-bacterial, anti-microbial to help create a sleeping surface, while providing even more pressure point relief. Sink into the luxury of full-body comfort, individualized back support and greater comformability. Built-in motion seperation means there's no partner disruption, so you'll both sleep soundly. And it's all wrapped up in carefully selected design details, putting the beauty back into a good night's sleep.